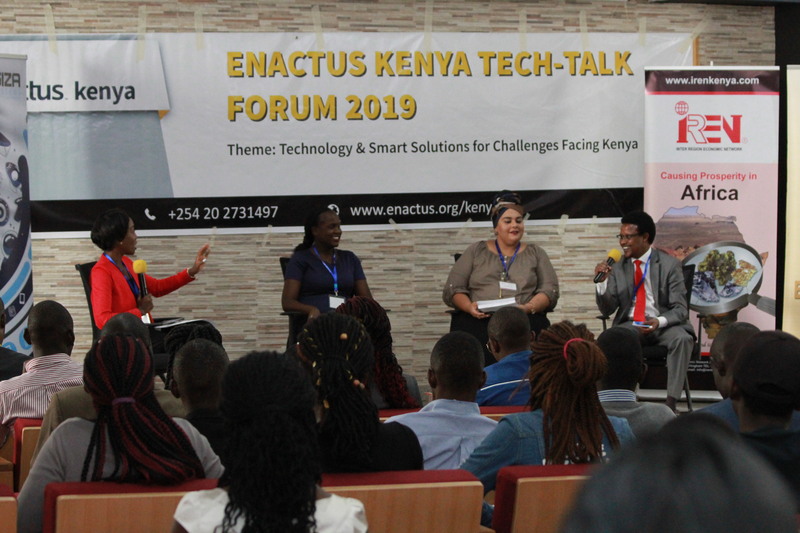 ENACTUS, Strathmore University, in collaboration with ENACTUS Kenya, hosted the 17th ENACTUS Kenya Leadership summit titled Tech-Talk, held on January 31 and February 1, 2019. ENACTUS, (Entrepreneurial Action Us) is a youth-led organisation that advocates for entrepreneurial activities to create social change and make a positive impact. The organisation believes in enabling young people to be problem-solvers by engaging in projects geared towards solving societal challenges. The two-day forum brought together student leaders from 21 affiliate universities across the country, and faculty advisors and representatives from the private sector with the theme for the year: Technology and smart solutions for challenges facing Kenya. Activities included a panel discussion with representatives from the private sector: Ms Najda Khan of Giza Systems, Mr James Shikwati, Country Director ENACTUS Kenya, and Director, IREN Kenya, Felistas Obonyo of Syngenta Kenya and Hassan Bori of Carmel Applied Technologies, moderated by ENACTUS Kenya Business Advisory Council member and Citizen TV journalist, Yvonne Okwara-Matole. Students got a chance to express their ideas and have them critiqued in a bid to come up with a concrete project for each university chapter. The forum also gave an opportunity for new university chapters, such as ENACTUS Moi University-West chapter, to make an introduction. Through workshops, students brainstormed on project ideas related to technology and smart solutions for challenges encountered in Kenya and were trained by the private sector representatives present on how to align their projects to the theme. Andrew Kimutai Ruto, while representing Strathmore University through iBizAfrica, extended an invitation to the universities present to embrace the opportunity for incubation of their projects. iBizAfrica is the business incubation and innovation centre in Strathmore University and has over five years’ experience in experiential entrepreneurship education and start-up development through business incubation and acceleration programmes. On completion of the forum, students presented their project pitches in a bid to grasp the three slots offered by the private sector, to be adopted and aided in developing their ideas into tangible solutions. Each university is expected to prepare and implement a project before the ENACTUS Kenya Expo scheduled for later this year. The national expo is part of the international action in which teams compete from 36 countries where the quality and impact of their projects is evaluated by business leaders who serve as judges. From each national competition one team is selected to represent their country at Enactus World Cup 2019 in San Jose, California (USA). This article was written by Diana Owuor, a third-year Bachelor of Arts in International Studies student and Team President, Enactus, Strathmore University.